Step 1: Make a set of bug tweezers by folding a plastic straw in half and taping slightly closed at the top. Another option is to use your kitchen tongs or any tweezers you may have. 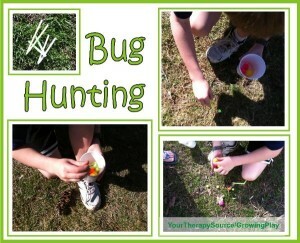 Step 3: On “GO” the child runs and picks up as many bugs as they can find using only the tweezers. Step 4: When all the bugs have been found, spill them out of the cup, and add up the total points.